Today Bungie released the trailer for the next Exotic Quest, The Draw, and its reward, The Last Word. This is a returning Exotic from Destiny 1, a real favourite among old hat Guardians including myself. Check out the trailer below, and watch to the end for a tease of Thorn. 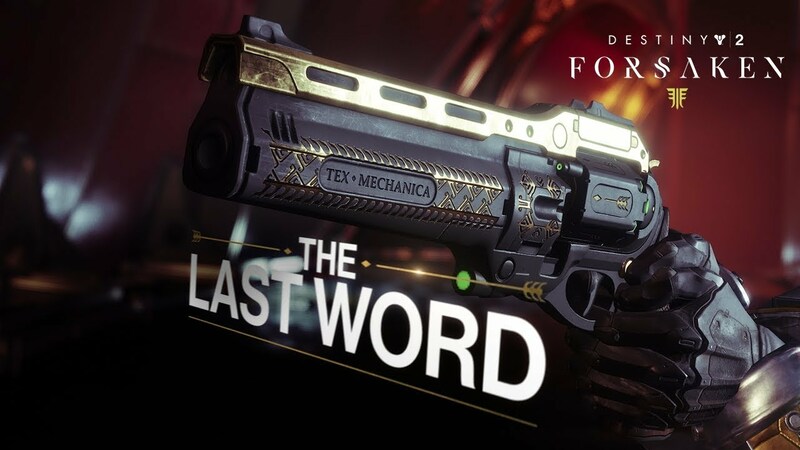 The Last Word is an incredible Exotic Hand Cannon that was easily my favourite weapon back in Destiny 1. It had the Exotic Perk, Last Word, which improved Stability and Target Acquisition when firing from the hip. Coupled with Hip Fire, which further increased accuracy when firing from the hip, this was a real old western sort of weapon. I used to run around the Crucible destroying Guardians all over the map with The Last Word, but that was then. Thunderlord was largely reworked when it was added last season, and I expect Bungie have made some similar changes with The Last Word. With Thunderlord chain lightning was advanced to raining lightning bolts, but I’m not sure what you could do to make extremely accurate hip fire more deadly. Adding a bonus that increased the damage to shots for a couple of seconds after drawing the weapon would be pretty great, but I have no idea what Bungie have actually done to The Last Word, if anything. Now the surprising part about the trailer for The Last Word comes right at the end. The trailer references next season, the Season of the Drifter, and then shows bullets from another Destiny 1 Exotic firing into a wall. That Exotic is Thorn. This was another well-known weapon in Destiny 1, and honestly it was a bit annoying when you were killed by it. The perks on it basically poisoned you and caused you to die a little bit faster, which made you die a little inside in real life when you realised what had happened. The reveal here of Thorn is pretty exciting, but it’s also quite exciting that bungie are now referencing next season. That should mean that season 5, the Season of the Forge, is coming to an end pretty soon. If I had to guess I’d say that with the end of Crimson Days next month will come the beginning of the Season of the Drifter. It would make sense for the seasonal event to be the transitional period between them, but we’ll have to wait until closer to the time to find out. Let us know what you think of this new trailer, and Thorn, in the comments.